He was all of 35 years old. Yet, on a very warm July morning, more than 100 of his closest family, friends, and co-workers gathered to honor and remember Sam and his life. Six days earlier, Jessica, his wife of four years, found him lying on the floor of their bathroom. By his skin color, it appeared he had already been in that position for a time. Jessica acted as quickly as she could—calling 9-1-1, administering CPR—hoping to revive him. In spite of her efforts, Sam was dead. Preliminary indications were that he died from negative reactions to changes in his medication regiment for a severe case of Rheumatoid Arthritis. As adults, we do 1,001 diets, try all different kinds of exercise regimens, ask the doctor for pills to help us lower our cholesterol or blood pressure. We pursue injections and surgeries to rid our body of wrinkles and/or rolls, all with the idea we can cheat death and keep it from coming…at least for a little while. We drink too much, smoke too much, spend too recklessly, laugh too little, drive too fast, get too angry, stay up too late, get up too tired, read too little, watch TV too much, and pray too seldom. We have multiplied our possessions, but reduced our values. We talk too much, love too seldom, and hate too often. We’ve learned how to make a living, but not a life. We’ve added years to life not life to years. When I asked Jessica what she would remember most about Sam, she said his smile, his laugh, and the way he loved her. She shared how Sam would write her notes telling her how beautiful and wonderful she was. He would remind her how very special she was and how thankful he was that Jessica was his wife. Jessica also shared that Sam was always willing to talk things out when there were problems and struggles. Sam loved Jessica, and never let her forget that. By Jessica’s account, Sam made the most of his life with her. He took advantage of the opportunities he had to communicate his love and commitment to Jessica. Not only do we not do death well in our society, neither do we do grief well. When we experience the loss of a loved one, our employer tells us we have three days, many of our friends and family want us to be over the loss in a matter of weeks…maybe months. If we grieve the loss longer than that, there is something wrong with us. Even the most recent mental health diagnostic manual tells us we have a serious problem if our grief is prolonged. 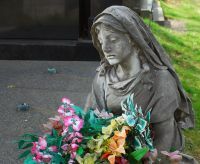 Being around death and grief is uncomfortable, and makes us uneasy. We would rather ignore the pain, the ache, the emptiness, and then struggle with our emotions. So we avoid the survivors, we don’t ask how he or she is doing, we don’t ask him or her to share the stories of their life together and what meaningful memories remain. What the story of Sam and Jessica emphasizes is the importance of love in our dealing with death and grief. Sam’s legacy is his love for Jessica—his willingness to be vulnerable, intimate, and intentionally connected with her. Healthy grieving, and the honoring of Sam’s memory, involves following Sam’s legacy and applying it to our own lives and relationships. Making the effort to invest our time and energy in those we love—working through struggles and problems with them; making the time to do things with them; sharing our thoughts, our dreams, and our fears with them. Share our affection for them through touch, as well as telling them—often—that we love them. Living out Sam’s legacy of love is to be understanding and compassionate with them, and forgiving of them. Be honest with them, demonstrating that we are trustworthy. The story of Sam and Jessica is a personal one for me. Though not their real names, Jessica is my niece and Godchild, Sam was her husband. Since Sam’s death a little more than two weeks ago, I have spent a great deal of time thinking about loss and grief. I also have reflected on how I can more effectively express my affection, care, and support for those I love. Sam’s passing has reminded me to live in the moment, and to enjoy the presence of those who are important to me. The loss of Sam has jolted me back to a place of enjoying the uniqueness and wonder of each special individual in my life. Sam left a powerful legacy for those who knew him. I am striving to live out his legacy as a way of grieving, as well as a motivation for being more intentionally connected with the significant people in my life. Thank you Sam for the gifts you gave Jessica, and for the legacy you have left us all. You are missed!